It's time to pump up the jams and get your groove on - time to bounce to the beat and jump to the bump... Ok, I think you get the idea!! 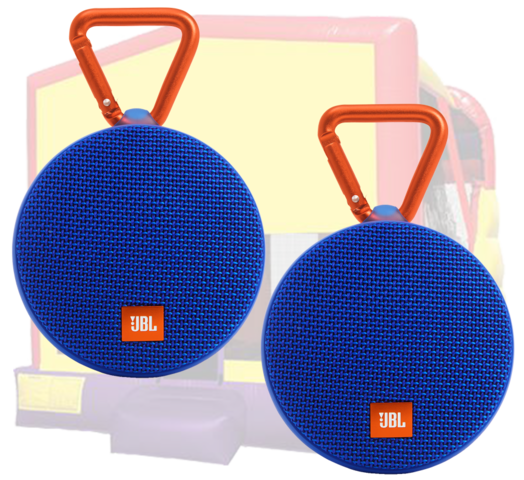 This upgrade includes 2 high quality waterproof wireless speakers that will fill a bounce house or combo with sound! What kind of sound? That's up to you because you are the DJ now! Whether you stream dance music on your device, phone, tablet, laptop or computer, or put on your favorite playlist, you can be assured that the party will go to the next level with this upgrade! How about putting on some workout music to get your burn on once the kids go to bed?! There are many ways to enjoy this great upgrade; give it a shot! HOW TO PAIR SPEAKERS: After powering up both speakers, push the Bluetooth button on one speaker to pair with your phone/tablet/laptop. Once paired, hold down Bluetooth buttons on both speakers for about 5 seconds to connect them together. Hang them high in opposite corners of listening area (they can be clipped onto the netting of any of our inflatables) and you're ready to rock! PLEASE NOTE: This is an upgrade item that requires ordering an inflatable such as a bounce house or bounce/slide combo.